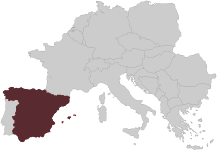 Spain is the most widely planted wine producing nation in the world, but only the third largest producer of wine due to very low yields and wide spacing of old vines.With more than sixty Denominación de Origens, or “DOs,” Spain has diverse terroir and varietals. Castillo de Monseran is located in Cariñena, Spain – the Spanish DO known as the birthplace of Garnacha. Castillo de Monseran is part of the Bodegas San Valero cooperative owned by more than 700 small independent growers with an average of 9 acres of vines, all known for their extremely low yields and exceptional quality. Castillo de Monseran’s old world charm and logo represent the traditional Spanish castles found throughout the region.